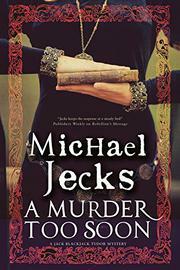 A reluctant crime solver offers a new perspective on the troubled early life and times of Elizabeth I.
Jack Blackjack’s life has improved immeasurably since his unwitting involvement in the failed plot to put Lady Jane Grey on the English throne in place of Mary (Rebellion’s Message, 2016, etc.). Now that Jack’s being paid by John Blount and his associates, who want to see Elizabeth crowned, he’s moved from a hovel to a nice house. Because he’s in trouble with Thomas Falkes, a dangerous thug who’s taken offense over Jack’s affair with his wife, he’s eager to leave London. Although Blount has hired him to commit various crimes, including assassination, Jack is a coward who hates the sight of blood and longs for a quiet life of wine, women, good food, and fancy clothes. So he panics when he’s ordered to the Palace of Woodstock, where young Lady Elizabeth is being held safely away from any rebellious plots, to kill Lady Margery Throcklehampton, a lady-in-waiting who’s been installed to spy on the princess. No sooner do Jack and Blount arrive than Jack stumbles over the corpse of Lady Margery, throat freshly cut and necklace missing. If he hadn’t been in the company of three maids when they found the body, he would have been arrested on the spot. Despite his alibi, Blount is convinced he did the deed. He’s about to be attacked when he’s saved by the daughter of Elizabeth’s keeper, Sir Henry Bedingfield. So many people think he’s guilty that he suffers several beatings, the arrest of his master, and threats from a variety of sources. Jecks infuses plenty of humor into his tale of misadventure, mixed motives, and unlikely friendships. Although Jack is lazy and indifferent to any particular cause, he’s forced to discover the killer to save his neck. An unlikely and amusing sleuth who manages to solve a tricky mystery against all odds.